Dr. Greg Bellow attempts to coerce some of our regular blind-tasting participants to open their cellars and part with a bottle of something aged. 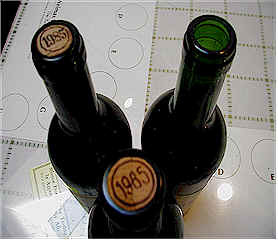 The theme of this tasting was "1985" and we compared four California Cabernets with four Bordeaux. The vintage is good in both regions. The summers and harvest seasons saw dry and warm weather, allowing vintners to pick the grapes with little difficulty. 1. Better to drink them too young than too old. 2. Sometimes wines have tannin levels which exceed the life span of the fruit. 3. 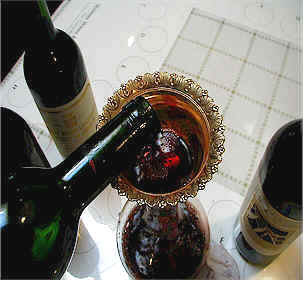 Some wines are best suited to the dinner table, rather than subjected to scrutiny in a comparative tasting. 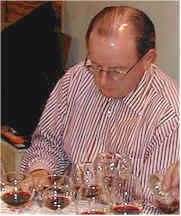 The bottles were opened and decanted two hours prior to the tasting. The bottles were then sparged with an inert gas, Argon, to keep them from changing (for better or worse). "Earthy, barnyardy with a stinky, grassy character." were the words of one taster. Others agreed with the overall grassy of vegetal character here. "It's reminiscent of cream of asparagus soup...I couldn't escape the asparagus challenge!" said another critic. "Unripened black cherry and sour cherry notes with tannic fruit tones and a funky tea character...also some sage and raisin notes." said someone else. I found the aromas reminiscent of tomato leaves and celery; some sort of V-8 wine! The wine is severe and tough on the palate, still showing a tannic veneer that makes for quite an unattractive wine. "This tasted matured, cedary and has some forest floor elements, with a saddle leather finish." said one eloquent taster. Another described the aromas as reminiscent of "Shell fish with crab-like note...buttery crab, but a bit acrid." they said. Others found a slightly "musty" quality in this wine. Most agreed it is still quite tannic and tight, one person describing it as "indestructible." Someone found it reminiscent of "cigar box aromas...clearly the wood predominated to the exclusion of all else." I found the first whiff to be somewhat corky or showing dank cellar notes, but the wine was probably not "corked" or it would have been significantly more "musty" smelling. The wine, as are most Dunn Howell Mountain bottlings, is still rather tannic and astringent. Whether or not the wine arrives at a point of maturity where the tannins soften remains to be seen. There is five to ten years' worth of tannin in this wine. At least. "This is the most tired wine of the tasting." said one opinionated soul. Another agreed, noting "It's gone." One person said "It was great, at first, but the fruit disappeared and it then showed a sour, pickled vegetable character with some tannin." Another opined "the wine sitting in the glass for 30 minutes...it didn't help." One taster described it as "rich and intense, but with a sulphur character, along with herbs, currants and chocolate...but the SO2 is bothersome." My descriptors for this were "old, tired and reminiscent of prune juice." The wine is still a bit acidic and certainly tannic. Overall a charmless bottle of wine that should have been consumed long ago. It's just tannin juice at this stage. "Cedary and showing some smoky plum and cassis notes, this also features chocolate and toasty oak notes." One lady found a "nice veneer of oak and a bit of white pepper spice, but it's tannic and 'mean'." Someone else found it to be "short and sharp, with some lively spice notes." 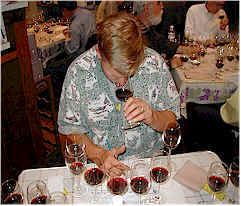 Another taster felt it was the "most complex wine of the tasting and still it has some cellaring potential." I found this to be a lovely, sweet, old and dusty Cabernet. 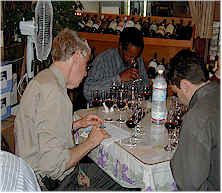 The wine still has some tannin and vitality on the palate, along with a bit of pencil shavings notes. One-and-a-half stars (three stars maximum, no stars being average, standard or worse). I'd consider drinking this in the next 2-5 years. "This had no nose and the acidity dominated the wine, which has some tart, sour cherry notes and a tart finish." A second critic found it "doesn't have much of a nose and it's still tight and firm on the palate, showing some wild berries and tobacco notes." Someone else described it as having "the nicest structure, good fruit and some elegance." Another person found "ample tannins with milk and cream notes, but not from the wood." One person criticized it for "lacking complexity on the palate." Someone found it to have "cayenne pepper on the finish with a fiery note." I enjoyed this wine, finding lots of nice, sweet, woodsy notes on the nose. The wine's theme of wood and oak continue on the palate in a pleasant manner with some lively acidity and a touch of tannin. It's probably best to drink it soon. One-and-a-half stars. Our lead-off batter found "smoky plum and cassis, with a vegetal note, green beans and coffee or coffee grounds in this wine." Another taster said it's the "biggest wine of the tasting, but has a grassy or green pepper note." One fellow found it to show "pickled pepper notes and it's borderline corked and sour." Another said "I love Brett (Brettanomyces)!" One woman described it as "having notes of black olive tapenade along with some cassis and pomegranate notes." Another taste found hints of "tobacco and coffee," while someone else found "Luscious, spicy notes with some green pepper and Brettanomyces in a rather tannic package." I found rather ethereal notes with hints of dried flowers. I struck me a definitely being a wine from Bordeaux on its nose. Beautifully balanced on the palate, it's still quite alive and showing nice fruit and that floral, ethereal quality. My guess is it can go for another 5-10 years. Two stars. "It's more Port-like than Cabernet." said one taster. Another found it "Elegant, with good structure, juicy black cherries and cassis." One taster found a disagreeable aroma they likened to "glue." Another participant found it to be "hot and volatile." Someone else described it as "Over-ripe, stewed fruit with Port-like elements." 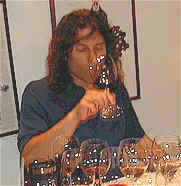 Another taster pegged it as having a "chemical nose," while some else found aromas reminiscent of "flowers." A final critic described it as showing "dusty, dried violet notes, with cassis. It's full-bodied and still tannic." I found the initial fragrances to remind me of some kind of rubber or plastic, showing old, earthy notes and hints of mature Port. It's old and earthy on the palate, showing some dusty notes and a fair bit of tannin. There's still 5-10 years' worth of tannin present. It is marginally better on the palate than on the nose. I'd probably be slightly more forgiving if it were a Zinfandel. As a side note, two tasters who dislike Port wines both ranked this as their top choice! "This has a taut structure, with herbs, cedar and earthy notes and a rustic finish." A young dad described this as having an aroma reminiscent of "baby diapers." Another taster found "Brettanomyces, with mushroomy and earthy notes. It's muscular and soft enough to drink now." Someone else echoed some of those sentiments finding it "Mellow, smooth and complex...drink now." Another taster found "Elegant, good fruit with a hint of charcoal and green pepper." Someone detected "Olive, vanilla and some cherry notes," while another person found it to be complex, saying something like it was a "nice instrument but they're playing the wrong tune." I found the nose especially complex...it had nice bottle bouquet and some dusty Cabernet fragrances. The flavors are nice, being a little bit soft and supple with a mild "bite" from some tannin. One-and-a-half stars.